INDUSTRY.co.id - Jakarta - National developer PT Agung Podomoro Land, Tbk (APLN) is optimistic that the Indonesian property market will improve further in line with the national economic growth in 2018. A number of indicators of the stretching of property business are visible from the massive development of property projects by developers both in Jakarta and in some area. The indicator is also underpinned by the government's target of stabilizing economic growth by 5.4 percent next year, not much different from the World Bank's projection that forecasts 5.3 percent growth in the Indonesian economy. On the other hand, a number of infrastructure projects have been and will be ready for community use, which will have a direct impact on the acceleration of the economy. "The existence of the facility is able to increase private interest to make investment, so that the investors both domestic and foreign countries not only invest in Jabodetabek which in the end the spread and even distribution of the economy can be realized," said Assistant Vice President of Strategic Residential Marketing APLN, Agung Wirajaya in Jakarta, Tuesday (5/12/2017). Based on that consideration, APLN dare to invest in West Java, especially South Bandung. "So far, the development and investment is only located in North Bandung area, until finally the government establishes North Bandung as a convertible area, we see the natural and natural South bandung, save a lot of potential to be explored and developed," he said. APLN is present in South Bandung with a new concept that has never been made in Indonesia. The project, which stands on 100 hectares of land, is named Podomoro Park which is planned to be officially launched in the first quarter of 2018. "By looking at the indicators of the national economy, we are optimistic that this new product will be absorbed," said Agung. 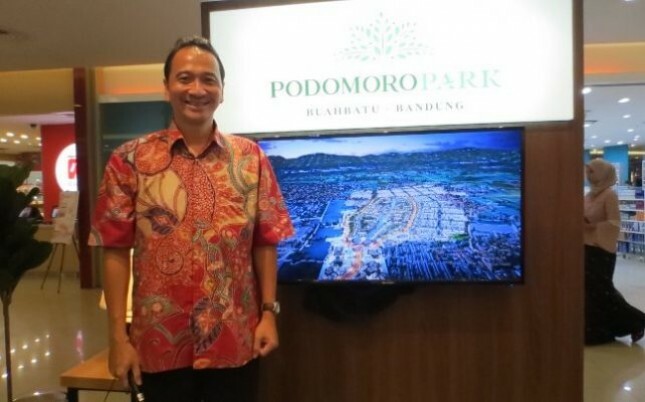 Furthermore, Agung said, the response to the Podomoro Park project is quite positive. "The last month we have started to test the market, introducing our concept to a number of residential agents and citizens of Bandung.And the response is quite good, there are already 300 enthusiasts who do NUP (order number)," he explained. In addition to targeting residents of Bandung, Podomoro Park Buah Batu also targeted residents of Jakarta, Bogor, Tangerang and Bekasi (Jabodetabek). Agung estimates that about 60% of the occupancy will be absorbed by Jabodetabek and other areas. While the rest will be absorbed by citizens of Bandung. "The reason is that 75% of the national economic turnover is in Jabodetabek, the people in the region tend to have better economic capability and they always want to have shelter in Bandung, especially for those who have studied in Bandung, they want to go back to Bandung and live in this city, "lid Agung.